This evening, beginning at 7, a mass of literary talent descends upon NE Alberta Street like a swam of fully mature locusts. Authors, poets, and spoken word artists will read their work simultaneously, creating a buzz at six different locations up and down the street. 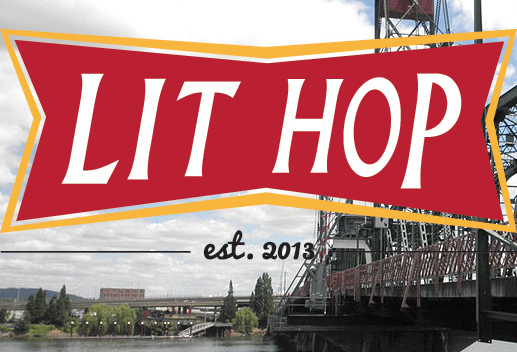 Portland’s second annual LitHop will see Hawthorne Books, the IPRC, alice blue, Eraserhead Press, Unchaste Readers, and Publication Studio each host a series in which readers will perform for 15 minutes, in quick succession. The idea is to create something of a literary pub crawl. During the event, listeners can pop up and down the street to hear several, very different performances. Three readers will perform for 15 minutes each at the top of the hour, leaving the remaining quarter-hour to talk, drink, or move on to the next place. “The 15-minute time slot gives readers more of a spotlight,” says Kevin Sampsell, who produces the event with Jeff Alessandrelli and Bryan Coffelt. One of those writers is Mykle Hansen. “Whenever we bring our best work and our best voice to these events, we’re reminding the world that real human people still exist, offline, off the page,” says Hansen, a frequent PDX Magazine contributor, who was invited by Eraserhead Press to perform at LitHop. Hansen is most likely reading from his most recent novel I, Slutbot, which PDX Magazine has an exclusive preview of here. The book’s robot-themed release party is this weekend at galleryHOMELAND. For Hansen, the experience isn’t just rewarding as performer, but also as a listener. In addition to the back patio of Bunk Bar and Via Chicago, readers and speakers will appear at Anna Banana’s, a coffee shop, Bella Faccia, a pizzeria, and Cruzroom, a bar, among others. 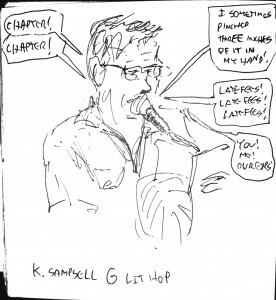 “It’s a thrill to take a bar or space that usually doesn’t host readings and see it become this room full of attentive people transfixed by the art of the written word,” notes Sampsell. LitHop runs from 7 to 9:45 p.m. at six different locations on Alberta Street. The night concludes with an after party at Radio Room at 10 p.m.